← Can I use PDF Editor software to replace Adobe Acrobat software? Adobe Acrobat Alternative: The Best PDF Software Replacement? How can I prevent PDF file on USB flash drive to being copy and paste either via right click or drag and drop copy to other device that is hookup to it like a PC? The file will be PDF, document file, JPG or some other image file, and some movie file etc.? The scenario is the file will be needed to be just viewable to show people but they cannot copy any part of it out from it other than admin level that create/authorize full control of it. Example is like a person on a field trip is bring some presentation stored on USB flash drive and show it on field premise to showcase company stuff like brochure, PowerPoint, concept drawing, sales figure etc. but we do not allowed them to have those file on the USB drive to being able to copied off to client's PC or even their own home without authorization. Not even a phrase or JPG image from a particular document etc. Pretty much just view only mode. In general, you can use VeryPDF DocSafe software to protect your documents, although VeryPDF DocSafe software can’t stop peoples to copy your PDF file in Windows Explorer, but it can stop peoples to open and view your PDF file, your PDF file is very safe, nobody can open and view your PDF file without your permission. 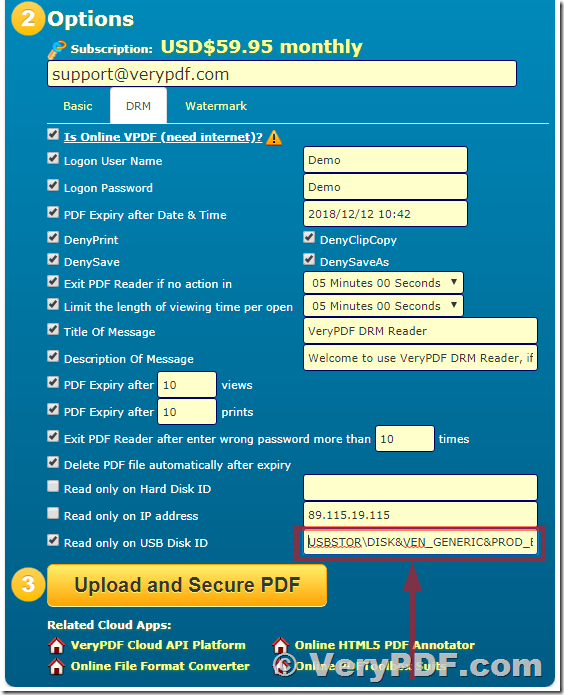 After you use VeryPDF DocSafe to protect your PDF file, DocSafe will generate a strong Open Password randomly, store this Open Password to VeryPDF Cloud Server, every time when a user try to open this PDF file, VeryPDF Reader will try to require this password from VeryPDF Cloud Server, if you block this user, this user will fail to open this PDF file. The PDF contents are encrypted by 256bit AES arithmetic, it’s impossible to decrypt the PDF contents without known the open password. PDF is the first choice for storing academic articles and other materials. Information in the PDF can be displayed explicitly with the most resembleness with the original script in color and font. To some extent, PDF can protect copy protection of then content in it, while unfortunately there are so many tools and plug-ins on the Internet so that anyone get the PDF file can easily break or convert it into a accessible format. Copy protecting PDF, text and other documentation files with its own copy-protect feature is not enough for people with valuable copyright data. If you crave more performance in stop illegal copy and paste on PDF documents, the USB Copy Protection function in VeryPDF DocSafe software will be the best choice for you! USB Copy Protection is specially designed function that controls access to and use of your PDF, text and other files or documents in your USB drives. 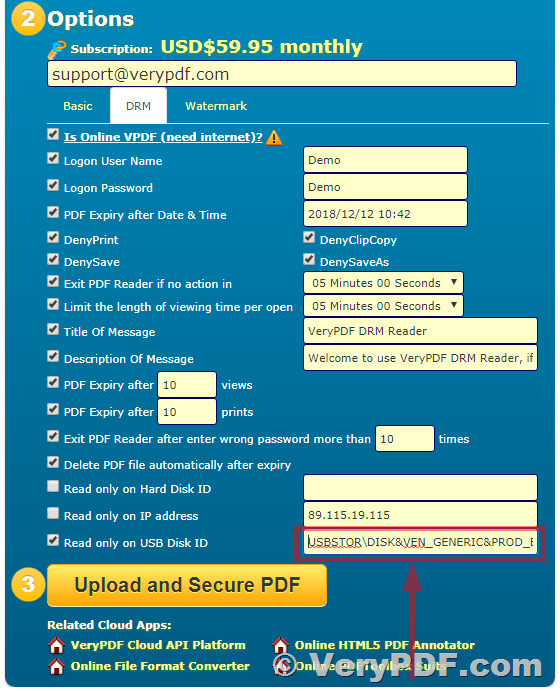 Click “Upload and Secure PDF” button, you will able to protect/lock PDF file to this USB disk properly. Stop PDF from being Forwarded / Emailed. You cannot stop PDF files from being forwarded or emailed to others, but you can stop the recipients from using those files, see "Stop PDF Copying" above. A VeryPDF DocSafe protected PDF file can be forwarded and emailed to another user but the recipient will not be able to view it unless the document owner has authorized them to use it. This entry was posted in VeryPDF Cloud API, VeryPDF SDK & COM and tagged drm pdf, lock PDF, pdf security, protect PDF. Bookmark the permalink.